The inflated cushion at the beginning of the workshop: some circles had been pre-taped by Virginia to model what was expected, and to get things started. 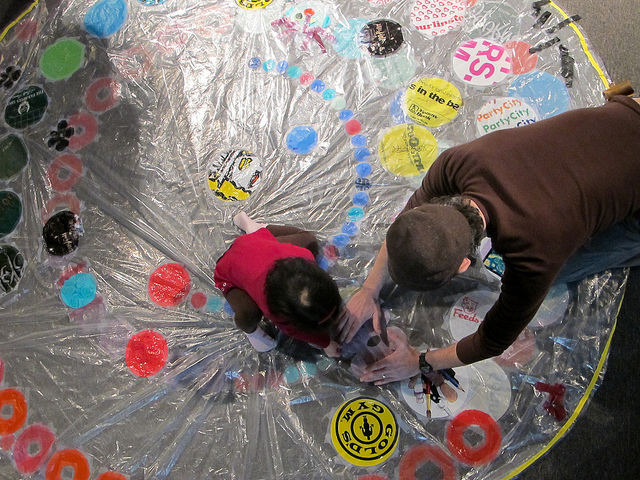 Virginia working with a young visitor, showing her how easy it is to tape decorative circles onto the piece. A very young girl, undaunted by the task at hand, is being helped by Michael. Proudly posing with her creation! Interesting an inspirational messages started appearing on the decorations. An interesting example of an idea spreading: one kid decided to try and make a “Whoopee cushion” from the plastic circles, and soon enough everybody was making one! 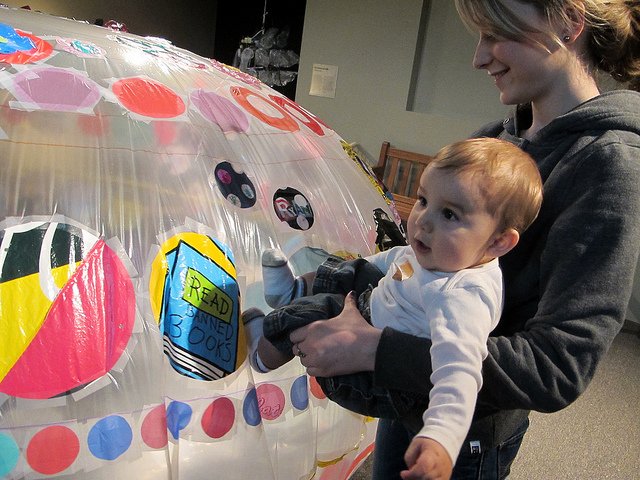 It was pretty irresistible to poke, touch, and wobble the inflated cushion. Even really little visitors were able to enjoy this piece! Almost finished, in its deflated state. 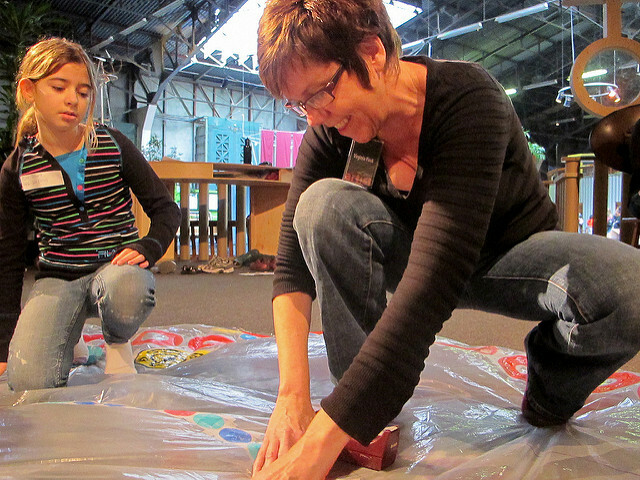 As part of this month’s Materiality: Plastic event, featured artist Virginia Fleck hosted a workshop in the Tinkering Studio where she invited visitors to collaboratively contribute to a giant inflatable meditation cushion! Virginia cut two 10 foot circles from thin painter’s tarp, and sewed them together along the edge; then she stuck a fan in an opening on the side, and the air from the fan inflated the whole piece into a big balloon. 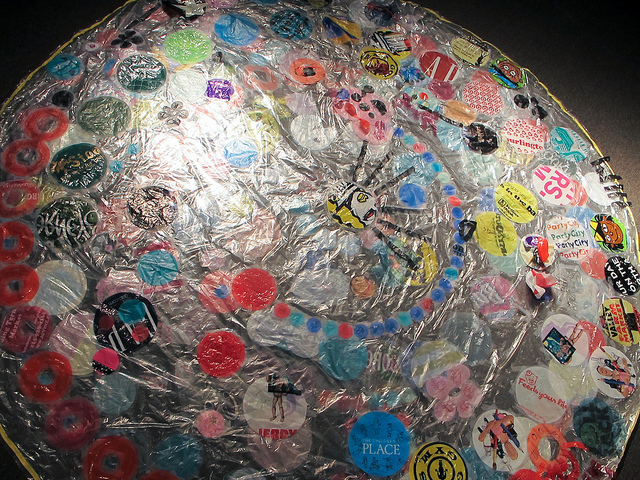 She carefully plotted out concentric circles on the flattened piece, to serve as guides onto which to place some of the hundreds of circles she cut out of recycled plastic bag… or not! Virginia was great with the public, and very easy going with her own art: she let visitors truly take ownership of their process, which often included deciding not to follow the pre-determined pattern, and give free reign to their creativity.